This week I want to show you some of the Halloween games I've made and link to some fun, fall and Halloween themed games that my fellow SLPs and teachers have created. So let's get going! 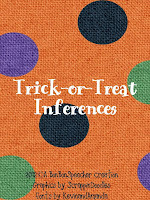 This first one is called "Trick-or-Treat Inferences" and it's available in The BonBonSpeecher Store at Teachers Notebook or Teachers Pay Teachers. It's designed to target inferencing skills, vocabulary, categorization, turn taking and reasoning and deduction skills. 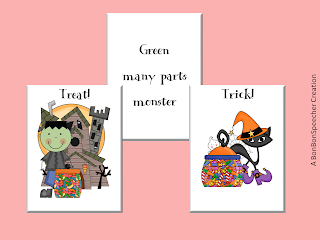 There are four "Trick" card and four "Treat" cards to accompany the 28 clue cards. 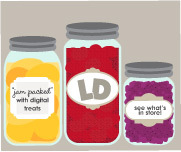 Clue cards describe iconic Halloween characters and popular Halloween candies. Game play instructions are part of the download as well, and there's a cute points card that can be printed, downloaded to an iPad, or projected onto a SmartBoard in the classroom. Kids will love guessing at the clues and won't even realize they're targeting goals! “Trick” cards take away one clue from the following card - the following card will be worth only 2 points max. 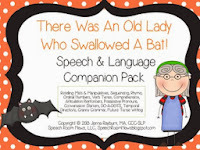 I'm planning to use this set from Speech Room News with my preschoolers. They loved the version for "There Was An Old Lady Who Swallowed Some Leaves" so I know they'll be excited to see this one for Halloween. You can visit Jenna's page to get more info on this amazing Book Companion Pack.